Intermediate care comprises strategies which allow early discharge from acute care, prevent admission or re-admission to acute care and avoid bed-blocking in both acute and long-term residential care. It encompasses a range of short-term options including rapid response, hospital at home, residential rehabilitation, supported discharge and day rehabilitation. Continuing Care is delivered on a long-term basis in a variety of settings and often includes an element of rehabilitation. Although these two types of care have distinct objectives, they are interrelated as changes in the supply of one type of care may affect demands for the other. In addition, from a patient perspective, intermediate and continuing care might be seen as part of the continuum of care options that are supplied to meet their needs. This book argues for consideration of intermediate and continuing care as part of the care continuum that provides integrated care adopting whole system approaches. 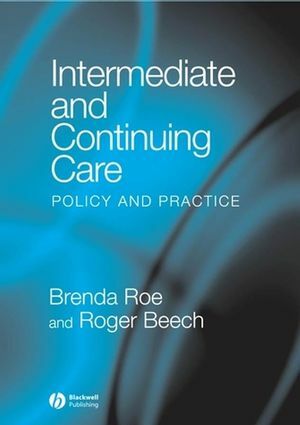 This edited volume explores policy, practice and current issues in intermediate and continuing care. It will be of interest to allhealth and social care professionals involved in the provision and planning of care for older people. It falls in three parts: intermediate care, continuing care, and a shorter section on patient and public involvement and future directions. Brenda Roe is on the Editorial board of JAN. She is Senior lecturer in Social Gerontology , Centre for Geriatric Medicine, Keele University and Non–executive Director, North Cheshire Hospitals NHS Trust. Chapter 1. Intermediate Care: Policy and Context. Chapter 2. Identifying Need and Scope for Intermediate Care. Chapter 3. Management and Planning of Services. Chapter 4. Coordinating Intermediate Care. Chapter 5. Service Development and Evaluation. Chapter 6. Interdisciplinary Working in Intermediate Care - Generic Working or the Key to a Person Centred Approach?. Chapter 7: Interdisciplinary Training and Development. Chapter 8: Evidence on Effectiveness of Intermediate Care. Chapter 9: Economic Evaluation of Intermediate Care. Chapter 10. Continuing Care: Policy and Context. Chapter 11. Community Care: Service Delivery, Development and Evaluation. Chapter 12. Alternative Housing and Care Arrangements: The Evidence. Chapter 13. Care Homes and Continuing Care. Chapter 14. Interdisciplinary Working and Education in Continuing Care. PART 3 INVOLVEMENT OF CARERS AND CONSUMERS. Chapter 15: Carers and Caregiving in the Context of Intermediate and Continuing Care. Chapter 16: Patient and Public Involvement in Service Design and Evaluation.